Here’s an informal poll: what books have changed your life? I’m not looking for a Facebook-viral list of 25 Important Books You’d Die on a Desert Island Without or anything like that. I want to know, what that one book is which changed something vital about your existence. You might have ten favorite books you could no sooner rank than you could choose a favorite among your children or pets. This is not that dilemma. What is the one piece of literature that made some aspect of you profoundly different? There are many books which have affected me deeply, no doubt, in a variety of ways. But one book that absolutely changed the course of my life is Gregory Maguire’s Wicked. This book, and dinner with the author himself at a mutual friend’s home, inspired me to pursue fiction writing seriously rather than to get another degree in poetry. The course of my professional life was forever and probably irrevocably altered by this choice. I’d love to know what book has mattered this much to you. In the comments below, leave an anecdote about a single book that has meant something special. In fact, the first five people to respond will get a free copy of Finis. for themselves or gifted to someone else. Today’s Women Writers Wednesday comes to us from Carla Jean Whitley about a book which had a deep and lasting impact on her. If you’re a bookworm, you’re probably acquainted with the experience of a book hangover, if not the term itself. It’s the feeling that overcomes you when you approach the end of a book that has captured not only your attention, but your heart. Book hangovers follow the stories, essays, or poems that affect a life so powerfully, it becomes hard to believe there are other books worth your time. Within the first two chapters of Anna Quindlen’s “How Reading Changed My Life,” I knew that I’d encountered just such a book. 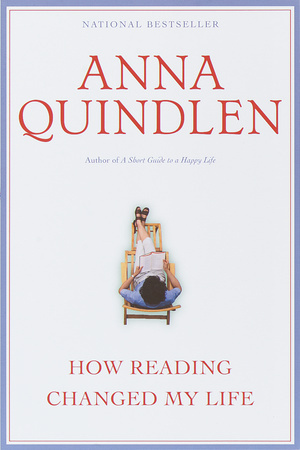 In this essay collection, Quindlen recounts the value of reading, whether the object of your affection is high-brow literature or a novel from childhood. It’s only 96 pages, and so I was mourning its inevitable conclusion by the end of the second chapter. “How Reading Changed My Life” immediately found a place on the shelf among my favorite, most-trusted books. It’s a book I turn to time and again, and one I frequently select as a gift for fellow readers. And while this remains the book of Quindlen’s I cherish the most, it is also the gateway drug. Her columns for the New York Times and Newsweek are compelling—she won a 1992 Pulitzer for her Times work, after all—and in the books that have collected those, I’ve found a kindred spirit. Quindlen is a writer, a mom, and a wife who offers insight on all areas of life. She left nonfiction years ago with the intent of working solely as a novelist (and her recent Still Life with Bread Crumbs is my favorite of her fiction). But over the years, Quindlen has continued to shed light on family, politics, life, and age. She is a woman I love to read. Carla Jean Whitley is a writer, editor, and teacher based in Birmingham, Alabama, where she is a features writer for Alabama Media Group. She is the author of Muscle Shoals Sound Studio: How the Swampers Changed American Music and Balancing Act: Yoga Essays. Her next book, Birmingham Beer: The Role of Alabama’s Largest City in Changing the State’s Beer Culture, is scheduled for release this spring. Connect with her at carlajeanwhitley.com. I won’t ask you to pick just one of those books! They are of a piece. 🙂 In fact, when I was first drafting this post, I initially had put the HP series in as books which had changed my life, but then I realized that Maguire’s work had a more directive influence on me than Rowling’s. When I read WICKED I was so impressed because I had thought I was the only one reimagining fairy tales to be wildly different stories rather than allegories. And while the Oz books aren’t really allegorical in the way fairy tales are, well, let’s just say I loved what he did with the source material. And he’s done that for other familiar narratives, too. I remember reading it, remember thinking after the first few chapters how boring it was. Many chapters later I was still thinking how boring it was. A few chapters later I bothered to ask myself why I was still reading it, and that was when I realised it wasn’t boring at all, and both the way it was written and the message it was conveying exploded onto my psyche. I won’t reveal the plot twists, nor the way the ideology of the book is delivered so tellingly. I’ll just say that it is jaw-droppingly good, thoroughly thought-provoking, and a ‘must read’ for any women who considers herself a feminist, a post-feminist, or not a feminist at all. I stopped there, and for some time read no further. I had to think. This is not (necessarily) the message of the book – and indeed the book has been criticised, not without good reason, for its failure to have a single male character that was not an enigma or did not rise significantly above the stereotypical. I can see why that is. It is because, to the narrator, to the ‘voice’ of the novel, the male characters are supposed to be that alien, that impenetrable. That is one reason why not only women, but also men should read it. The book may be, very clearly, about the position of women in American society in the 1950s and 1960s, but because of its provocative style and plot, it makes a reader of either gender take a long, hard look at both, and measure themselves, their gender, and their contemporary society against that of the book. Moreover it invites us not to be congratulatory about our own circumstances and society. It’s not an easy read, I’ll say that. As I already have a copy of ‘Finis’, please pass me by on that offer. If I can think of someone to whom to gift it, I’ll let you know. If I can’t, please give ‘my’ copy to the next participant. That sounds really provocative indeed, Marie. 🙂 I can see why it was so impactful to you! If you think of someone who will like FINIS. who doesn’t already have it, drop me an email, and I’ll gift it along. The first book that came to mind was Philip Larkin’s The Less Deceived, a collection of poetry with themes highlighting the poet as observer of life rather than participant. This idea has remained with me ever since. In terms of a novel I’d have to go with Virginia Wolff’s Orlando – this was my first introduction to Wolff and the concept that we have the ability to live many lives in various guises whilst retaining the essence of intrinsic identity. Very nice. I remember being taken with ORLANDO’s form as well. 🙂 Watch for an email from me.